If you're an unpublished author and have written a children's book, or are looking to do so and understand that the visuals are just as important as the story, this post is for you. I have compiled a list of questions I am frequently asked about working with an illustrator when submitting a proposal for a children's book. I love this question because 1, it's always great to meet people who are interested in writing books for children—we need more stories with a wider range of representation—and 2, it's a great opportunity to share what I know. • My responses are for those who are interested in pursuing the publishing house route, because I have not produced any books using through self-publishing I can't really speak on what that process entails. If you're interested in self-publishing some of this might be applicable, but most is very different. So one of the questions you have to consider is: how will you get this book out in the world? With self-publishing a lot of the production, distribution, promotion, editing, etc. will fall on you but you pocket most of the revenue made from your book. Working with a publisher allows you to use their resources but you're paid in advances and royalties, which are percentages of the revenue made from your book. You have to weigh the benefits and disadvantages to decide what works best for you and your vision. • Another thing to note, I am speaking from the perspective of an illustrator/author who has worked with several publishing houses, but that does not mean my experience is the rule. Every relationship between an author, publisher, and illustrator is unique so please keep that in mind. How do I find an illustrator? When looking for an illustrator it really depends on the look and feel you're thinking about for the story. For example, if you want more realistic drawings, abstract, modern, or traditional. This is when working with a publisher helps if you haven't done this work before. Publishers have an in-house art director to offer guidance, and they have a lot of experience on how to pair the right illustrator with the right story. With that, it's often better to wait and see what the publisher or art director has in mind. Sometimes they have great insight on what the market needs, or have access to illustrators who are new, or know illustrators who have done work like this before or are passionate about the topic. There are so many factors to consider, but don't bog yourself down with this yet. Focus on getting your story completed. I have a story completed, is it typical for the author to pay for the illustration up front or would a payment arrangement come if the book is published through the publisher? In self-publishing, I'm not sure if it's typical for a writer to pay up front, but if you do self-publish I recommend offering an advance, which typically is a chunk of money for the time the illustrator is putting in to illustrate the book, and then offering royalties, which is a percentage of revenue for each book sold. It's a fair way to share the wealth, especially if the book does really well. But it is really up to the illustrator. They can work with you to determine what makes sense for the budget and time. If you're going the publishing house route and really want to have some illustrations to accompany your proposal I recommend finding an illustrator you'd like to work with and offering a fee for them to do 2-3 illustrations to submit with your manuscript to help sell the book. Then when the rights for the book are purchased, the publisher can pay you and the illustrator an advance. The lowest advance I've heard for an illustrator doing a children's book is $9,000, which is sometimes broken up into 2-3 payments over a period of time from the beginning to the delivery of final artwork. Don't be afraid to pursue a book deal without an illustrator though. Visuals always help with a picture book, so it is very important to have them incorporated into your proposal. Another way to sell the idea is by creating a really beautiful submission letter with some background info about your story and why this topic is so important to you. In your proposal consider creating a page featuring artists you'd like to work with, or a moodboard of images that represent how you imagine the look and feel of the book. Any tips on finding a publisher? I think the most important thing is to be clear on your story, be clear on the message, audience, and purpose before reaching out to any editor or publisher. Once you clarify those points that should guide you on who to reach out to. Choose your top three editors/publishers that make sense for the book. Look at their other titles and figure out where your book fits among them. Editors want to make sure it's the right fit, and it helps if you do the work for them first. Also, something important to think about, how will your book live beyond the shelves and pages? In this digital/social media world editors love hearing how you envision the book inspiring other content. Like educational material for classrooms, worksheets, events or workshops, and how this story can live online. Think about how you can build a whole story or brand around this book. It sounds like a lot but think of it as something fun. This doesn't have to be elaborate, these can be three bullet points added to your submission. I really hope this information helps. It's a lot to think about and can sound overwhelming but editors get so many submissions every day, and these are tips that can really help a manuscript stand out. The most important thing is to crystalize the story and be passionate about the message, and everything else will fall into place. Chronicle Books offers great resources for submitting a manuscript, even if you don't submit to them I think it's great to read over their suggestions. I've used their guidelines to write all of my proposals. And here is a great post about submitting Children's Books to Chronicle. On their blog they also have a great post on the book process from manuscript to book shelves. When I got the green light to write this book, I was totally thrilled. Here was my chance to bring together stories, essays, illustrations, advice, and tips related to the importance of building and nurturing one’s creative community. After coming off a successful book tour, I was reminded how important it is to be surrounded by people who want to see you excel and thrive, inspiring me to share that message. I have to admit, though, that once I sat down to write and draw I kept getting stuck. How do you really teach someone about building a creative community? We all know that strong, supportive, and inspiring relationships happen organically. For example, you meet that one colleague who gets your obsession with vanilla lattes and instantly you two share daily coffee breaks, which soon buds into a dynamic professional relationship. Or you are seated at a dinner party and overhear another guest mention their upcoming trip to South Africa, where you have just returned from. You exchange email addresses so you can send them your list of recommendations. The next thing you know, you two are linking up regularly to share other travel tips, and then you end up going on a trip together. You can’t plan these kinds of things, nor can you force them. Special relationships like these just happen. It was an honor to celebrate their stories, but most importantly it was a blessing to be able to create a book kids, especially kids of color, could go to to see different definitions of success and what happens when you follow your dreams. Recently my friend and fellow artist/designer, Hadiya Williams, launched her new business and shop, Black Pepper Paperie Co.—a lovely stationery, clay ware and maker's studio based out of D.C. There you can find beautifully patterned clay dishes, jewelry, textile and paper products. I'm fanning out over her mark making and limited color palette of black and white. She also offers some fun freebies, like free downloaded patterned paper that can be used for wrapping paper or collage. Download here. And see some of her inspiration on her IG stream here. Women Who Project is an interview series highlighting women of color we admire and who inspire us in art and design. Jeanetta Gonzales is a graphic designer and surface designer who has taken her creative interests down a related but new path, into the realm of editorial illustration. Her visual style is lush, inspired by nature and layered with pops of surprises, and captivating with rich color palettes. All of which translates beautifully into pattern designs and whimsical imagery. Jeanetta shares a bit about her process, how sharing her skills and knowledge fits into her practice, and what she'd like to see more of in the industries of art and design. You have a background in graphic design and pattern/surface design and now transitioning into illustration. Tell us about this shift. What prompted it, and how are you liking it so far? Illustration has been an interest of mine and something that I've been wanting to explore. My surface design and graphic design work involves commercial illustration where I sell or license my art for products and illustrate logos and graphics for clients. I see an explosion of illustrations on everything now from packaging, illustrated books, in ads, magazines and blogs. Hand-drawn art has become popular and since I paint and do lettering I began to notice new and exciting ways to apply my work that I hadn't considered before. Editorial illustration is a great fit. Today I want to talk about the genesis of Women Who Project. A few months ago I was having some productive conversations with fellow female artists friends of color about not coming across platforms that consistently feature women of color and their work. One conversation in particular was with Tanekeya Word, the writer behind the new series, Women Who Project. One afternoon on Instagram we were DMing back and forth about some of my concerns surrounding being a black woman in the commercial arts navigating a realm where so few of us have ventured, and not finding platforms that support or celebrate our work. I expressed to her my hunger and eagerness to see more of us being highlighted, to read more about our stories, and see more about what we are doing. But for 2017 I predict a shift. I see more artists like Nuri Abdur-Rauf, who we just posted about last week, on other design and typography blogs, and shared across various social media outlets. (Her work is brilliant!) I claim that the work from people like Angela Pilgrim, Kenesha Sneed, Lulu Kitololo, Gabi Smith, e Bond, Mengly Hernandez, Chioma Ebinama, and Nikki Farquharson (and many many more) are highlighted and given the recognition they deserve. And not just the visuals or products these women create but also being recognized for the activism, community building, and entrepreneurial projects they are spearheading. I am looking forward to seeing all of these women featured on panels at conferences, doing talks, being invited to collaborate with brands, teaching workshops, and being flown around the world to exhibit their work. Fly has always been a platform where I created what I wanted to see. It's been the place where I share the important work from people, especially women of color, who reflect my community and who inspire me. I will that in 2017 and beyond, that Fly is just one of MANY blogs, publications, and media platforms that support and celebrate women of color in the arts, specifically women of color in the commercial arts: the illustrators, the graphic designers, etc. In knowing this, Tanekeya and I discussed what we could do now. How do we support this vision? In that conversation I remembered that it is all up to us. And that meant getting back to work on creating more content that reflects what we want to see. My books and other works are extensions of that idea, but I'm looking to getting back to using my platforms to support that vision. And that was how Women Who Project (and the resurgence of my desire to post more on Fly) was born. What I know for sure is that the people in my tribe are creating some dynamic work with simply the intention of creating dynamic work. With that, we need to create spaces that are sustainable, spaces that allow us to support our families, build communities, have comfortable homes in comfortable neighborhoods, eat well, put gas in our cars, HAVE a car, collaborate with others, develop brands, create new platforms, and continue to do good work. Most importantly we want to shine light on unspoken narratives, capture and share untold stories. We want to thrive and grow, and give back. And have the freedom to create. And one thing we all know for sure is that that freedom comes with opportunity and information. We know that exposure leads to opportunity which then leads to access to resources and then more opportunity. Which is why I'm so excited about getting back to highlighting talents that are often overlooked. We hope to offer exposure that leads to opportunities. So that's what we hope to do with Women Who Project and the other posts to come on Fly. This blog is a space that celebrates our light in a way that empowers us and allows us to BUILD. Are you excited to see what happens in 2017? I am. Seeing this vision come to life starts with us. Check back soon for ways we can do this together. Also, share in the comments below platforms you love that celebrate women of color in the arts. Women Who Project is a new interview series highlighting women of color we admire and who inspire us in art and design. Interviews are conducted by guest author, educator, and artist Tanekeya Word. How did you arrive at creating the Girls with Difficult Names project? The creation of #girlswithdifficultnames came from a place of wanting to celebrate and elevate names that don't make the Top Baby Names lists. That aren't easy to say when you first encounter them, but roll off the tongue with repetition. It came from wanting to poke a huge hole in the idea that it's ok to treat such names—and the girls that embody them—differently than names you've seen a thousand times. I believe people don't deserve scrutiny based only on the unique sound and spelling of their name, whether one's name has an origin steeped in culture/tradition or because it came purely from someone's imagination. I think I've been marinating on #gwdn my whole life. Growing up as a Black girl in the suburbs of Atlanta, with a full Arabic name was interesting, to say the least. During elementary school, I didn't like my name. I thought it was too complicated and only brought me unwanted attention. Kids made fun of it, I got called Mary a lot, there were many raised eyebrows and long pauses. I make very different first impressions with people when I meet them in person vs. when they first meet my name in written form. It often feels like people are trying to reconcile my name with my persona. Sometimes it's negative, sometimes it's just sincere confusion, sometimes it's authentic interest and sometimes there's no reaction at all. Usually, I get questioned about why I have a "full Muslim name" and I'm not Muslim, which I answer. And after people go through that initial reconciliation, the buzz surrounding my name fades away and I just become Nuri. All of these experiences led me to become aware from an early age of all the underlying layers of meaning placed on names and how they become labels or identifiers. I truly began to appreciate my continent, Africa, when I left it. At the age of eighteen, I moved to the US to study at Pratt Institute from Kenya. Being in New York, I met people from all over the world and what was especially memorable was meeting people from all over the African continent. I learned about their cultures, tasted their food and danced to their music. Although a lot of these experiences were new, they were also strangely familiar. They made me feel at home. I took the opportunity to learn more about my continent, informally through social interactions but also in the classroom while also studying African literature, film, politics, anthropology. My love for my continent grew and grew. During this time, I met a handful of people who'd travelled extensively across the continent and they planted a seed in me. I was suddenly beginning to fantasise about one day "taking a year out" to go from one African country to the next. Visiting, exploring, learning. There was no concrete plan for this ambitious trip (that would happen one day), but I held onto the hope that someday I'd actually take some action towards this dream opportunity. About a year ago, I met two amazing Kenyan photographers who I’d been following on the interwebs for some time, Joe Were and Mutua Matheka. As our friendship grew, they let me in on a trip that they were planning to take: a road-trip from Nairobi to South Africa and then back again. I was excited for them and a little bit envious. Taking three months “out" to do something like that wasn’t an option for me. But as time went on, I started to challenge myself about that thinking. Why exactly wasn't it an option? Didn't I work for myself so that I could have flexibility and freedom? I brainstormed a plan for taking care of business AND being unavailable for three months while on the road. I decided to make it work. Of all the people I'd met who'd done some sort of extensive African travel, not one of them was actually from Africa, nor black. Why is that? Why not? That's one of the things we'll be untangling with our trip. Sharing, with others who look like us, what it's like to travel by road, across borders, in Africa. We know there will be some challenges but we also know, without a doubt, that it just may be the most enlightening and enriching journey we've ever taken. We want to transport as many of you with us as possible. That's why we've created a Kickstarter campaign that ends on the 24th of December. On one hand, we get to create artistic works in response to our travels: a photobook, a colouring book, prints and a web series that you can all enjoy. On the other hand, we get to prove that we can come together to make things happen, including by leveraging the funding power of the crowd. You can find out more about our route, why we're focusing on cities, our crew and how you can support us here. I hope that our trip will be inspiring, enlightening and of value to you too. My homegirl and fellow artist, Lulu Kitololo, is one quarter of a group looking to unscramble Africa. Lulu, along with photographers Mutua Matheka and Joe Were, and storyteller/filmmaker Josh Kisamwa will be taking a road-trip across southern Africa where they will explore and document their discoveries in 10 countries and 13 cities (all in 15,000 km which is about 9,300 miles). For the project, entitled Unscrambling Africa, their goal is to document the "stories, people, sub-cultures, and environment" of the continent showing a different perspective from what is typically shown. This project will only happen with our support. The team launched a Kickstarter campaign to fund the expenses for the trip. If you want to see and support "images of Africa, by Africans, in Africa" then check out their Kickstarter video and page here. Recently, artist Christa David made the leap and decided to leave her job to pursue a career as a full-time artist. She shares about her new artist-life experiences and latest inspirations on her blog where she captures her excursions into gallery exhibitions and how she navigates her new found freedom. When you finish catching up on her blog posts, pop over to her online shop and gallery and get a glimpse of her beautiful collages, prints, and paintings. I love her exploration of color, emotion, and layering of textures. I'm eyeing several of her collages for my own collection. These would make perfect holiday gifts, too. Oakland!!! Join printmaker, surface designer, and teacher Jen Hewett and I this Saturday for a discussion about entrepreneurship, creativity, and self-care. Copies of Becoming Me will be available for purchase, and I'll be hanging out to chat and sign. Next stop after Oakland is LA. For more information about that event click here. Becoming Me is here! Today is my publication birthday and to celebrate I'm sharing some paper goodies that can be used in the book. There are hints of these patterns I created for Becoming Me and I'm making them available for you to download for free for the next 48 hours. You can also download my collection of collage bits (sparkly diamonds and juicy lips). These were edited from the book but I am making them available to you. Use them to collage in the book or on your own art projects. Have fun making art! 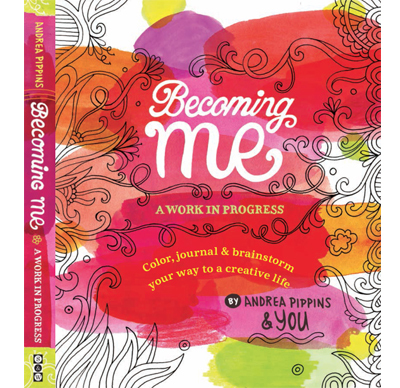 And please share with me what you create, you can post on Instagram using the #BecomingMe or #BecomingMeBook. Download of this item entitles the user for personal and group use. Download of this item does not entitle the user to mass-reproduce the images (either digitally or in print) for sale. Sometimes you see something and you are instantly blown away. That's how I felt when I saw the work of Quill Queen on Instagram. She uses paper, just paper! !, to create her elaborate illustrations celebrating various hairstyles. Her work is incredible! Check out her IG stream to see the many variations in style and color. Becoming Me is coming!! It releases on October 11th but I am ready to giveaway a few advance copies now. I am on a mission to collect 250 images of your coloring in I Love My Hair. My goal is to create a personal library showing different styles of coloring, color palettes, and the different tools being used to color. So show me your I Love My Hair photos! 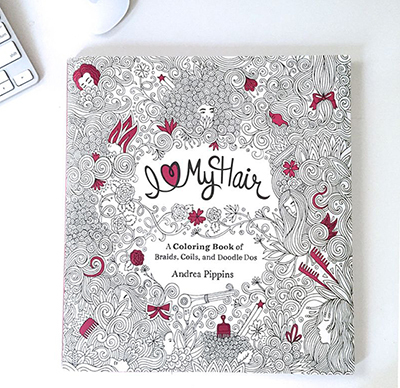 You can enter by posting a photo (or as many as you like) on Instagram of a colored in page in I Love My Hair. Next, tag the photo with the #IHeartMyHair hashtag. You can also tag me, @andreapippins, but you are only considered part of the giveaway if you use the #IHeartMyHair hashtag. Over the next four days this week I will select 3 winners who will receive an advance copy of Becoming Me and exclusive Becoming Me stickers. Be sure to use natural lighting when possible, consider showing your coloring tools, and make sure the photo highlights your amazing coloring. Check out the examples below for ideas. The giveaway ends Friday, September 30. All winners will be announced by midnight (EST) on that day. Can't wait to see your photos! This is my first fall semester not teaching in 5 years and it feels really weird. I miss working with young designers. Their enthusiasm is infectious and their perspectives are so fresh. It's always so inspiring. For the last 2 fall semesters I taught a branding course at MICA and one of my favorite projects to give was what I called Campaign for Change. Students were to create and brand a social campaign based on a word they selected from a box. They had to make that random word inspire an entire movement. The task was often daunting, but they always created some amazing work related to real world events or hypothetical instances; some were serious and heavy while others were fun and happy. For the project I provided a ton of resources (the brief was 4 pages long), including some great tips from one of my favorite organizations, DoSomething.org. Then recently, after revisiting those 11 tips, I thought it might be helpful to make my own and put together a doodle sheet for others to use as guidance to start their own awareness campaign for change. This free download provides a starting place for creating a concise message, and developing a plan of action with a defined end result. This Campaign for Change sheet can be used in the classroom, at home, or church—anywhere. Fill in the sections with your ideas and color to make the ideas pop. Have fun and make change!